I had her on the coffee table with her lid part way off to refresh her water , and replace her paper bedding and my 7 yr old very boisterous and noisy grandson unexpectedly and suddenly came back from the study were he was doing some drawing with his granny. Gutzy took fright , leapt and pushed her way past the loose lid , was on the coffee and off in flash on the floor disappearing under the lounge. A few minutes later she was ontop the sunny part of the lounge basking and glaring at the Mouse Trap game board on the other coffee table before coming back to sit ontop the fax-phone-ans combo machine on the corner table module for a few minutes but was spooked again by the grandson (she is NOT keen on him). Been very rainy / overcast cool/windy here since Gutzy was adopted. Sun finally came back out this afternoon and I noticed she was very active in her tub , lots of digging in corners, standing in corners trying to get lid off... she'd noticed it was sunny and I believe she wanted to get to the sun. 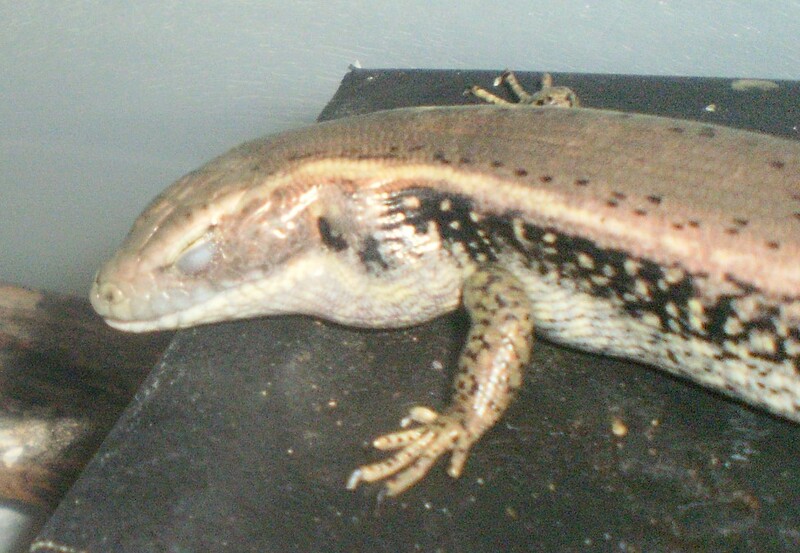 So she's back to being a guest (house) skink , at least for the next few days , until the grandson goes back home …. I'm back to giving her worms and crickets as treats when she comes back out looking to bask , to warm up, and back to leaving some water out for her in plastic lid. Was nice caring for her, and fun watching her behaviours and how she interacted with us for the last few days …. I think she'll be happier when the grandson goes , and might allow me to reinstall her in her 10L tub next week (if stays inside or keeps up with her visits). 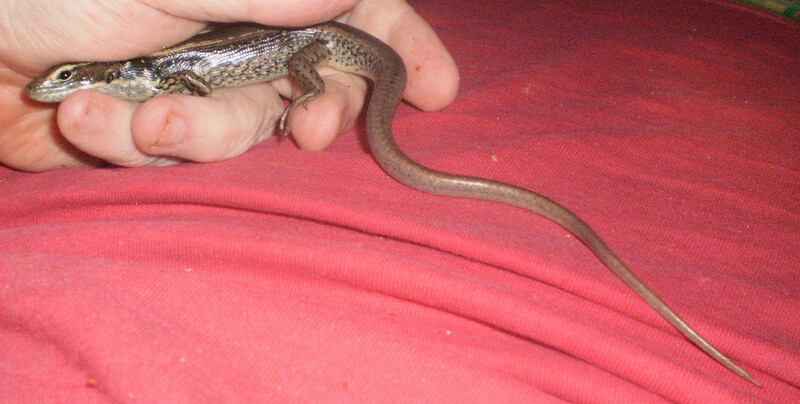 15mins after the grandson was collected by his stepdad, and the sound level in the house went from very noisy to nice and quiet , and it went caotic to calm , Gutzy showed up and was chilling in the middle of the lounge room head nodding at me… skink talk for " I'm back , I'm hungry ,where are my bugs ?" . 6 mealworms later and she was ontop the lounge taking the sun …. and keeping an eye on me. I've set out a feeding dish for per with some worms in it in the corner near the corner of the lounge …. If she doesn't want to live in a big tub (for now) , I'm happy enough to have her visiting until she is ready. 6 mealworms later and she was ontop the lounge taking the sun …. Last edited by kingofnobbys on Thu Oct 11, 2018 10:13 am, edited 1 time in total. kingofnobbys wrote: 15mins after the grandson was collected by his stepdad, and the sound level in the house went from very noisy to nice and quiet , and it went caotic to calm , Gutzy showed up and was chilling in the middle of the lounge room head nodding at me… skink talk for " I'm back , I'm hungry ,where are my bugs ?" . I've set out a feeding dish for per with some worms in it in the corner near the corner of the lounge …. If she doesn't want to live in a tube (for now) , I'm happy enough to have her visiting until she is ready. This really tickled me, I love catching up on this thread, you are lucky to have so many interesting lizard characters around! Sunny today (first sunny day all day so far October) …. but very windy and cold (outside) , but warm inside …. Gutzy paid a visit to me about 9pm …. she was right next to me on the lounge (I felt her against my outer left thigh , I thought she was cricket or roach so went to swipe away, then discovered it was Gutzy, she was not amused and leapt off the lounge before I could react). 3 house skinks now - Gutzy and her boyfriend both here this afternoon ( the boy looks younger , and has a full ORIGINAL ISSUE TAIL = very impressively long cf Fluffy's and Gutzy's regenerated tails), and is broader on the head. And a juvenile about 12 months old as well …. had all 3 visiting the lid full of water I've placed on the floor just now …. Gutzy was visiting most of the morning and looks quite a bit plumper now than a few weeks ago. Her boyfriend has followed her inside and has been checking me out from a safe distance his afternoon. He's a bit shyer than Gutzy , took worms tossed to him but is wary of getting too close. He doesn't seem to know about the fooddish . And a juvenile about 12 months old as well , about half Fluffy's head size …. the little one is very timid but was studying me and Peppa while I was feeding Peppa …. had all 3 visiting the lid full of water I've placed on the floor just now …. Fluffy knows there are visiters , she's been standing in the corner looking at them and headnodding at them. 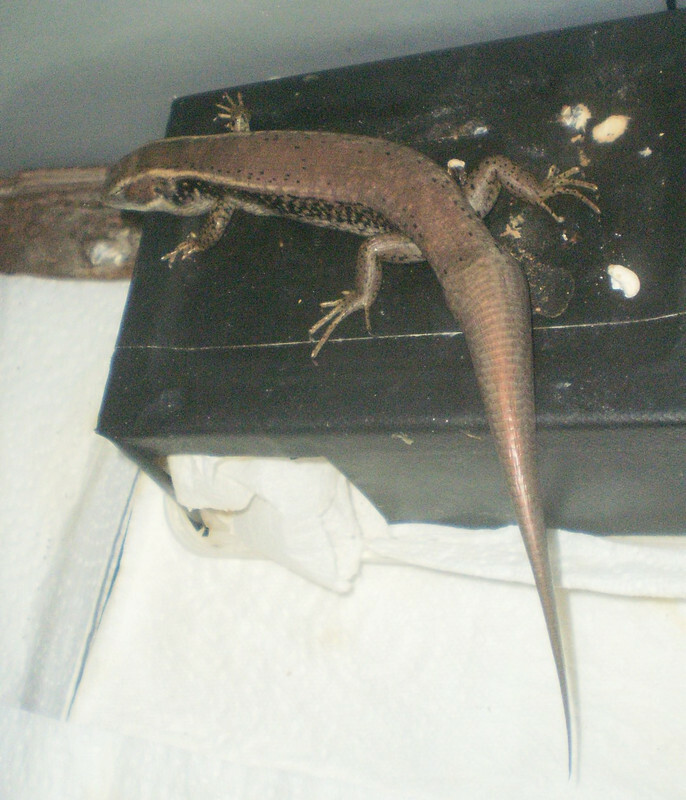 kingofnobbys wrote: 3 house skinks now - Gutzy and her boyfriend both here this afternoon ( the boy looks younger , and has a full ORIGINAL ISSUE TAIL = very impressively long cf Fluffy's and Gutzy's regenerated tails), and is broader on the head. I know why Fluffy, the two BTs and my big beardie Peppa have been fascinated with back of the lounge and the corner of it lately.... they all knew there were visitors . She's certainly a force to be reckoned with and is VERY VERY greedy …. I think the male followed her inside and strongly suspect the juvenile is her daughter ….. setting up an 6 month old 26W UVB200 (my Solarmeter says it's still giving 80-90 microW UVB / sq.cm at 8" from the bottom of the bulb so should be OK for these waterskinks, my BTs and beardies wont mind it either when they are on the floor) in one my old domes hung under the Komodo lamp stand tomorrow for them so they wont feel the need to go outside for UV. Would be nice to tame the male and the juvenile. Wow! I wish we had lots of lizards in our yard as well. Where I live small five lined skinks and some ankles are native but I’ve never seen them. Hopefully I can attract some! The boy (Cheakie) is guarding our front patio / pile of building stuff (there) and has been scratching on the outside of our front window and head nodding at us while we looked out at him. I know it's him as he's got a very distinctive scar on his tail that I spotted last time he was visiting inside (a few days ago when I saw him on the top of the lounge). 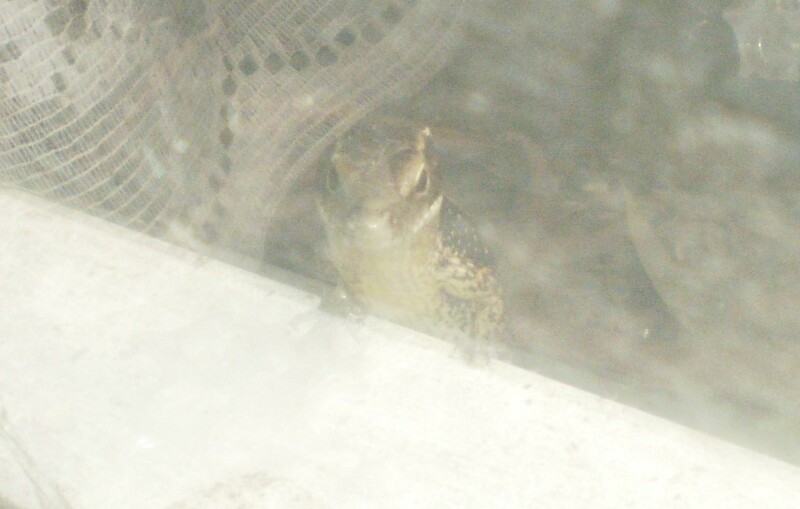 Gutzy is still heavily pregnant and hanging out under our back steps …. 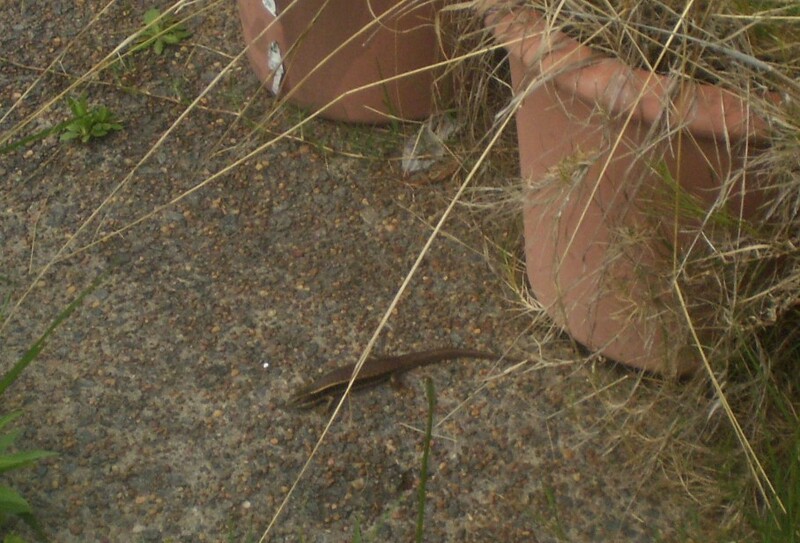 Spotted a big head peaking out at me from between the old 20L selfwatering flower pots (used to be my herb/berry garden) , so we have a resident bluetongue skink hanging out in our yard …. and it's a big one ! Back inside , gave my wife a wee surprise this morning …. all she saw was a long tail disappearing under the fridge at brekky …. I heard a plunk behind the lounge yesterday so I knew a skink was back inside. I've since seen a little head poking out from under the Engal Car Fridge / Freezer ( our "bar" fridge inbetween long road/ camping / fishing / photo holidays ) after lunch when the house was quite and my wife had retired to the study to do her Etsy crafty stuff, and I've discovered the bunch of mealworm lavae and pupae and two dead crickets that were left in a feeding dish on the corner lounge table have vanished since yesterday. Gutzy is back inside , made immediate use of her fooddish after studying me for a while from the top of the lounge while I was eating my lunch. Fluffy sound asleep ontop her little house at 2am …. didn't have the heart to disturb her to put her to bed in her house …. She has me well trained …. she sits ontop her house or her piece of bark and looks at me "jedi" mind powers willing me to pick her up and get her out for "funtime". If she's hungry she links my finger and nibbles it to tell me she wants a few worms or pupae , which She very daintily takes from between my finger IF I've decapitated them and squeezed some yummy stuff out , other wize she just stares at them …. cheakie-boy-looking-in - living up to his name … and he has been inside for the last few days , making visits to the sun on the top of the lounge. Today he was so greedy he leapt off the lounge into the 30L plastic archive box I was sorting my latest monthly delivery of bulk medium crickets in got himself trapped in the tub and he unable climb/leap back out , so I let him eat a few crickets before transferring him , so he's in Gutzy's 10L isolation tub for now. Wasn't very happy about my grabbing him (but with 1000 crickets scurrying and hopping in all directions (tipping the tub on it's side to let him out wasn't an option ,the only option was to reach in and corner him from above (very scary for a little wild skink) and to grab him with my hand as gently as I could. A few squeaks (yes water skinks can be vocal …. 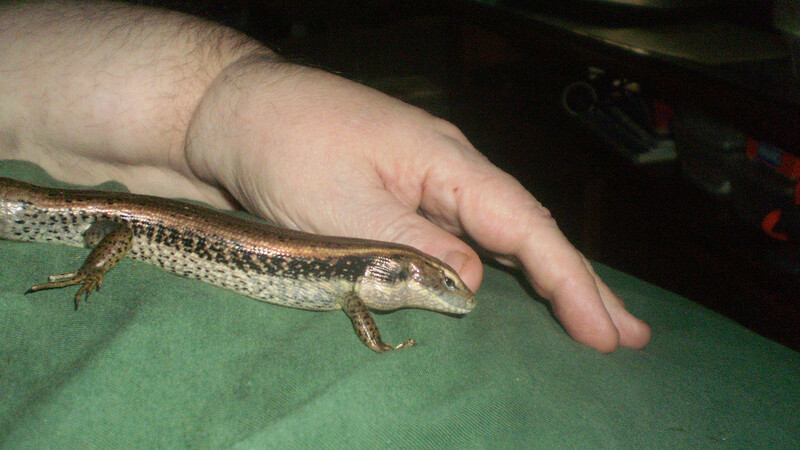 squeaks mean "I'm scared" or "ouch" , "barks" mean "I'm having fun" from what I've observed with these little skinks ..., but he soon settled down when I placed him on my tummy under my cupped hand …. really long original issue tail , just the last few mm seem to be missing ( sibling nipped it off ?? perhaps ). Wasn't upset/scared enough of me to drop his tail which is a good sign (==> partly tame already). Will give this little boy a day or two to feed him up while I decide whether to keep him as captive pet or to release him. He's already availed himself of the feed dish (which has meal lavae and pupae in it - several raids - very hungry !!!) and demolished a freshly dead silkworm moth , and discovered the water dish which seems appreciated by him (he is a "WATER" skink). Gutzy is still outside , still very pregnant , and still hanging out near my weedy pots. Fluffy has been a pampered pet for 1 year today .